This article discusses using the custom date format field to format dates in a view. 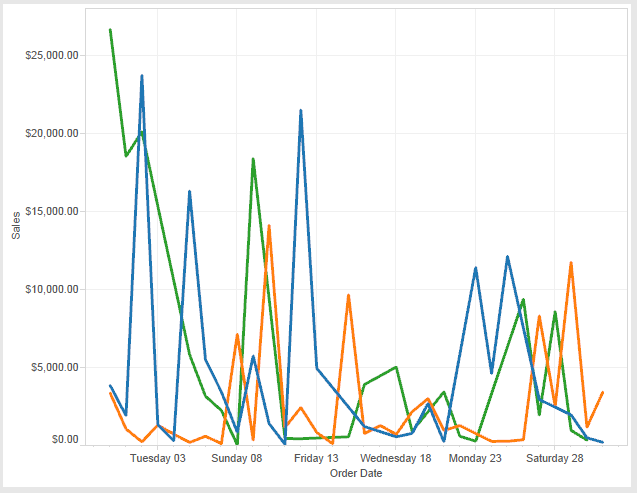 For an overview of how Tableau works with dates, see Dates and Times, or Changing Date Levels. For setting date properties for a data source, see Date Properties for a Data Source. To format a date field in the view, right-click (Control-click on a Mac) the field and choose Format. This will open the Format panel to the left of your view. Select the Dates field. 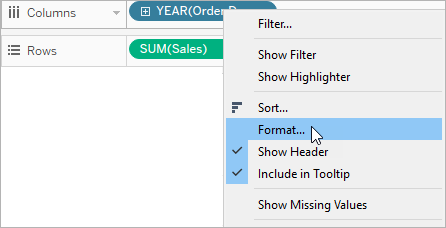 When you format dates, Tableau presents a list of available formats. In most cases, the last item in the list is Custom. 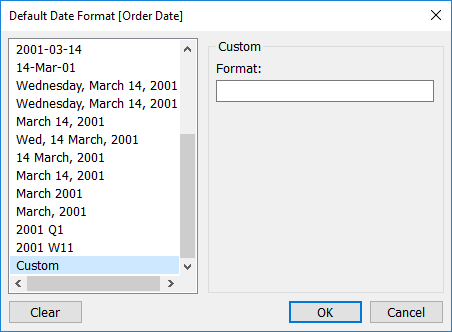 You specify a custom date using format symbols listed in the Supported date format symbols table, either alone or in combination. To format a date field in the Data pane, right-click the field and choose Default Properties > Date Format. Tableau retrieves date formats from the data source. Tableau Server can also retrieve date formats from the Run As user account on the server that is running Tableau Server. Note: The following date formats might not be the same as those used with the DATEPARSE function. See Convert a Field to a Date Field for more information. Use the following symbols to construct a custom date format. (:) Time separator. In some locales, a different character is used to represent the time separator. The time separator separates hours, minutes, and seconds when time values are formatted. The actual character used as the time separator in formatted output is determined by your system settings. (/) Date separator. In some locales, oa different character is used to represent the date separator. 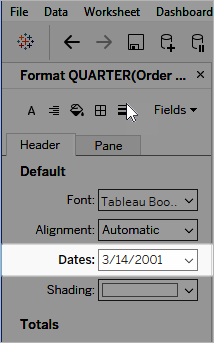 The date separator separates the day, month, and year when date values are formatted. The actual character used as the date separator in formatted output is determined by your system settings. ttttt, in that order. Display only date information if there is no fractional part to the date serial number; display only time information if there is no integer portion. d Display the day as a number without a leading zero (1 31). dd Display the day as a number with a leading zero (01 31). ddd Display the day as an abbreviation (Sun Sat). dddd Display the day as a full name (Sunday Saturday). ww Display the week of the year as a number (1 54). M Display the month as a number without a leading zero (1 12). If m immediately follows h or hh, the minute rather than the month is displayed. MM Display the month as a number with a leading zero (01 12). If m immediately follows h or hh, the minute rather than the month is displayed. MMM Display the month as an abbreviation (Jan Dec). MMMM Display the month as a full month name (January December). oooo The same as MMMM, but localized. q Display the quarter of the year as a number (1 4). y Display the day of the year as a number (1 366). yy Display the year as a 2-digit number (00 99). yyyy Display the year as a 4-digit number (100 9999). h Display the hour as a number without leading zeros (0 23). Hh Display the hour as a number with leading zeros (00 23). N Display the minute as a number without leading zeros (0 59). Nn Display the minute as a number with leading zeros (00 59). S Display the second as a number without leading zeros (0 59). Ss Display the second as a number with leading zeros (00 59). 000 Display milliseconds. Use a period character as a separator before specifying milliseconds. Any of the date formats symbols in the table above can be used alone or in combination. Specifying a custom format yyyy-MM-dd HH:mm:ss.000 would produce dates in the format 2015-05-10 11:22:16.543. Such a format might be appropriate for scientific data. Specifying a custom format DDDD DD would produce dates that show the Weekday and the Day, as shown below. Specifying a custom format yy-mm-dd (dddd) would produce dates in the format 18-01-04 (Thursday). Specifying a custom format "Q"1 YYYY would produce dates that show Q1 2018. Set your workbook locale to Japanese. Right-click the field in the view for which you want to set a date format. In the Format pane, from the Dates drop-down list, select a format. g Short era name (such as H for the Heisei era). gg Era name (such as 平成). ggg Long era name (for Japanese, this is currently the same as the regular era name). e Era-based year, such as 1 for the first year of an era. ee Era-based year, such as 01 for the first year of an era. If there is only one digit, then the era-based year will have a zero added to the front. The language code forces the date to be treated as if it is a Japanese date. To avoid this issue, do not show era-based dates in quick filters if your workbook will be viewed in a browser. To prevent Tableau from doing this, put double quotes around the letters and words that should not be treated as date parts: “Fiscal Quarter” q “of” yyyy. If you want a literal quote inside of a quoted section, insert this code: “\””. For example, the format “Fiscal “\”” Quarter” would be formatted as Fiscal “ Quarter. If you're using the DATEPARSE function in an extract , use the syntax defined by the Unicode Consortium. The following table lists the field types that can be represented in the format parameter of the DATEPARSE function. Click the field type to get information about the symbols, field patterns, examples, and descriptions from the Unicode Consortium website. All symbols are supported in .hyper extracts with the exception of "U." Negative values denote a year before Christ (BC). For example, DATEPARSE('y',''-10') returns the first January of 11BC and DATEPARSE('y,'-0') returns the first January of 1BC. When working with calendar year "y," the pattern "yy" requests the two low-order digits of the year. For numbers < 70, the DATEPARSE function returns the year 2000+x. For numbers >=70, the DATEPARSE function returns the year 1900+x. When working with "Y" in "ISO week date" based calendars, the year transition occurs on a week boundary and may differ from calendar year transition. The "Y" designation is used in conjunction with pattern character "w" in ISO year-week calendar. The ISO week date system is effectively a leap week calendar system that is part of the ISO 8601 date and time standard. Similar to "y," negative values for "Y" denote a year before Christ (BC). All symbols are supported in .hyper extracts with the exception of "I." The month designations is used in conjunction with "d" for day number. In contrast to ICU, .hyper extracts allow values 1-12. Other values will cause an error. All symbols are supported in .hyper extracts with the exception of "W."
When working with "w," in contrast to ICU, .hyper extracts allow only valid weeks. A year has 52 or 53 weeks (ISO 8601). The DATEPARSE function validates the input. For example, an error occurs for the 53rd week of 2016 because the 53rd week does not exist for 2016. When working with "W," ICU does not support this designation, but it's useful for dates like 1st Monday of September. When working with "d," in contrast to ICU, .hyper extracts only allow valid day numbers. For example, an error occurs for the 31st of February. When working with "D," in contrast to ICU, .hyper extracts only allow valid day numbers. For example, an error occurs for the 366th day of 2017. Only "h" and "H" symbols are supported in .hyper extracts. When working with "h," .hyper extract don't allow negative values for this field. Negative values cause an error. When working with "H," .hyper extracts don't allow negative values for this field. Negative values will cause an error. Minute Note: In contrast to ICU, .hyper extracts don't allow negative values for this field. Negative values will cause an error. In contrast to ICU, .hyper extracts don't allow negative values for this field. Negative values will cause an error. When working with "S," DATEPARSE('ss.SSSS', '12.3456') returns 1990-01-01 00:00:12:3456 AD. Quarter Note: In contrast to ICU, .hyper extracts only allow values 1-4. All other values will cause an error. When working with "e and "ee," in contrast to ICU, .hyper extracts only allow values 1-7. All other values will cause an error. When working with "c..cc," in contract to ICU, .hyper extracts only allow values 1-7. All other values will cause an error.